Sunday, February 3, 2013 ratings — New episodes: Elementary. 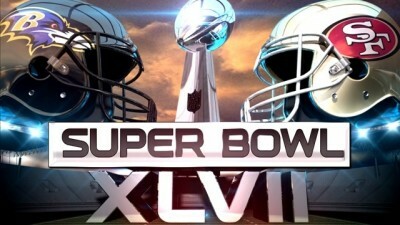 Sports: Super Bowl XLVII. Specials: Live from New York: The First Five Years of Saturday Night Live: (rerun). Episode reruns: America’s Funniest Home Videos, Shark Tank, Modern Family, Bob’s Burgers, The Cleveland Show, The Simpsons, Family Guy, American Dad, and Betty White’s Off Their Rockers. 7pm – America’s Funniest Home Videos: (rerun) 0.4 in the demo with 2.13 million. 8pm – America’s Funniest Home Videos: (rerun) 0.6 in the demo with 2.59 million. 9pm – Shark Tank: (rerun) 0.6 in the demo with 1.78 million. 10pm – Modern Family: (rerun) 0.5 in the demo with 1.41 million. 10:30pm – Modern Family: (rerun) 0.6 in the demo with 1.80 million. 7pm – Super Bowl: 38.5 in the demo with 108.55 million. 7:30pm – Super Bowl: 39.4 in the demo with 110.50 million. 8pm – Super Bowl: 36.4 in the demo with 100.27 million. 8:30pm – Super Bowl: 35.4 in the demo with 95.43 million. 9pm – Super Bowl: 34.5 in the demo with 93.28 million. 9:30pm – Super Bowl: 35.2 in the demo with 93.22 million. 10pm – Super Bowl: 34.0 in the demo with 89.25 million. 10:30pm – Super Bowl & post game: 29.7 in the demo with 77.03 million. 11:11pm – Elementary: 7.8 in the demo with 20.8 million. 7pm – Bob’s Burgers (rerun) 0.3 in the demo with 0.74 million. 7:30pm – The Cleveland Show: (rerun) 0.4 in the demo with 0.96 million. 8pm – The Simpsons: (rerun) 0.8 in the demo with 1.91 million. 8:30pm – Bob’s Burgers (rerun) 0.7 in the demo with 1.74 million. 9pm – Family Guy: (rerun) 0.9 in the demo with 1.97 million. 9:30pm – American Dad: (rerun) 0.8 in the demo with 1.74 million. 7pm – Betty White’s Off Their Rockers: (rerun) 0.3 in the demo with 1.40 million. 7:30pm – Betty White’s Off Their Rockers: (rerun) 0.3 in the demo with 1.31 million. 8pm – Betty White’s Off Their Rockers: (rerun) 0.5 in the demo with 1.93 million. 8:30pm – Betty White’s Off Their Rockers: (rerun) 0.5 in the demo with 1.94 million. 9pm – Live from New York: The First Five Years of Saturday Night Live: (rerun) 0.5 in the demo with 1.96 million. These are the fast affiliate ratings. The “demo” refers to the viewers in the 18-49 demographic. The percentages represent the change since the previous original episode. (Percentages aren’t given for reruns or specials.) “Millions” refers to the total number of viewers. What were you watching last night? The Super Bowl, reruns, or something else? Huh, this years Super Bowl didn’t beat last years. Didn’t last years Super Bowl get like 111 million viewers?